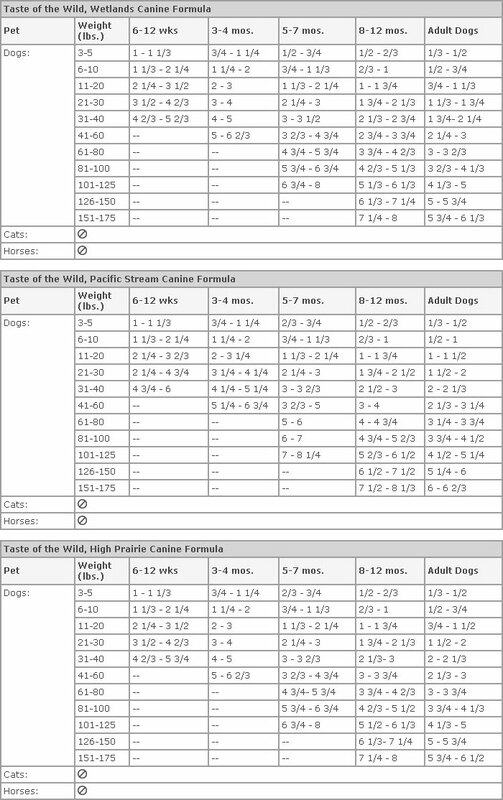 What is Taste of the Wild Canine Formula Dry Dog Food? Taste of the Wild Canine Formula foods are hearty and nutritious meals for dogs of any age, size, or breed. Real lean cuts of meat and fish (certified hormone free and antibiotic free) provide highly digestible sources of protein, while sweet potato and peas are used to provide your dog with high levels of energy. Whole fruits and vegetables provide vitamins and antioxidants to boost your dog's immune system. This dog food also contains proteinates (protein compounds), which help your dog's body absorb the nutrients to get the most out of the food. 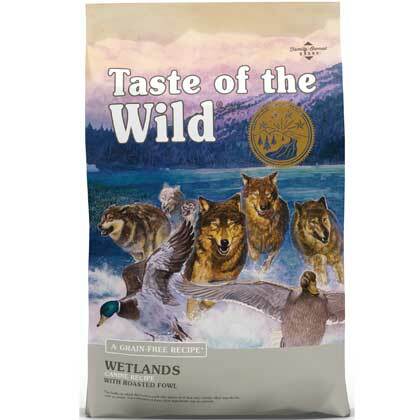 Taste of the Wild is grain free, which makes it a great food for dogs with intolerances or allergies to grains. How does Taste of the Wild work? Ingredients: Duck, duck meal, chicken meal, egg product, sweet potatoes, peas, chicken fat (preserved with mixed tocopherols), potatoes, roasted quail, roasted duck, smoked turkey, natural flavor, tomato pomace, ocean fish meal, salt, choline chloride, dried chicory root, tomatoes, blueberries, raspberries, yucca schidigera extract, dried fermentation products of Enterococcus faecium, Lactobacillus acidophilus, Lactobacillus casei and Lactobacillus plantarum, dried Trichoderma longibrachiatum fermentation extract, vitamin E supplement, iron proteinate, zinc proteinate, copper proteinate, ferrous sulfate, zinc sulfate, copper sulfate, potassium iodide, thiamine mononitrate (vitamin B1), manganese proteinate, manganous oxide, ascorbic acid, vitamin A supplement, biotin, niacin, calcium pantothenate, manganese sulfate, sodium selenite, pyridoxine hydrochloride (vitamin B6), vitamin B12 supplement, riboflavin (vitamin B2), vitamin D supplement, folic acid. Calorie Content:Contains 375 kcal per cup. Ingredients: Salmon, ocean fish meal, sweet potatoes, potatoes, canola oil, salmon meal, smoked salmon, potato fiber, natural flavor, salt, choline chloride, dried chicory root, tomatoes, blueberries, raspberries, yucca schidigera extract, dried fermentation products of Enterococcus faecium, Lactobacillus acidophilus, Lactobacillus casei and Lactobacillus plantarum, dried Trichoderma longibrachiatum fermentation extract, vitamin E supplement, iron proteinate, zinc proteinate, copper proteinate, ferrous sulfate, zinc sulfate, copper sulfate, potassium iodide, thiamine mononitrate (vitamin B1), manganese proteinate, manganous oxide, ascorbic acid, vitamin A supplement, biotin, niacin, calcium pantothenate, manganese sulfate, sodium selenite, pyridoxine hydrochloride (vitamin B6), vitamin B12 supplement, riboflavin (vitamin B2), vitamin D supplement, folic acid. Calorie Content:Contains 360 kcal per cup. Ingredients: Bison, lamb meal, chicken meal, egg product, sweet potatoes, peas, potatoes, canola oil, roasted bison, roasted venison, natural flavor, tomato pomace, ocean fish meal, salt, choline chloride, dried chicory root, tomatoes, blueberries, raspberries, yucca schidigera extract, dried fermentation products of Enterococcus faecium, Lactobacillus acidophilus, Lactobacillus casei and Lactobacillus plantarum, dried Trichoderma longibrachiatum fermentation extract, vitamin E supplement, iron proteinate, zinc proteinate, copper proteinate, ferrous sulfate, zinc sulfate, copper sulfate, potassium iodide, thiamine mononitrate (vitamin B1), manganese proteinate, manganous oxide, ascorbic acid, vitamin A supplement, biotin, niacin, calcium pantothenate, manganese sulfate, sodium selenite, pyridoxine hydrochloride (vitamin B6), vitamin B12 supplement, riboflavin (vitamin B2), vitamin D supplement, folic acid. Calorie Content:Contains 369 kcal per cup.